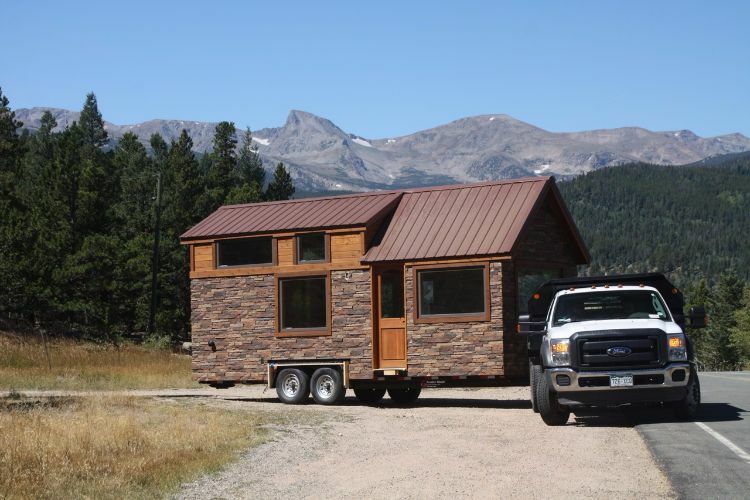 Venture into the mountainous landscapes of Boulder, Colorado, and you will encounter a tiny house building company that has made simplicity its lifelong mantra. 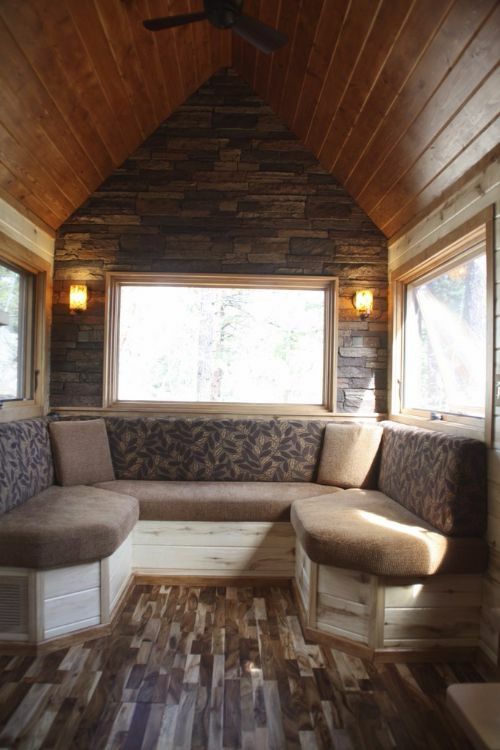 The aptly named SimBLISSity Tiny Homes is a family-owned business that strives to create comfortable, customized living spaces that promote a sustainable and active lifestyle. One of their highly praised designs is the charming Stone Cottage that we shall explore today. A remote Colorado Front Range haven that was custom built for a client, this Stone Cottage is sure to inspire all tiny house enthusiasts in their pursuit of their happy place. Find your own sense of bliss by joining us on a tour that celebrates the simple details that enhance the tiny living experience. There is a reason we're starting with a picture of the cottage on the move. You see, this 20-foot (6.1-meter) tiny house is unique in that its wheels can actually be concealed to make it look like a fixed dwelling. See what we mean? The skirting has been designed to create the illusion that the Stone Cottage is on a foundation. 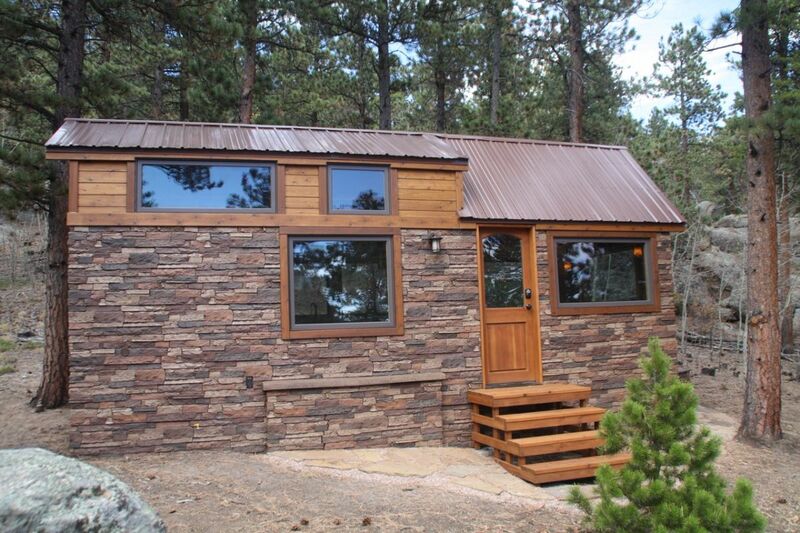 Appealing to the full off-the-grid cabin experience, the exterior flawlessly incorporates stunning faux stone siding and wholesome wooden materials. Staying true to its name, SimBLISSity effortlessly achieves harmony and zen by adorning the Stone Cottage's stationary trailer tongue with a Buddha sculpture. 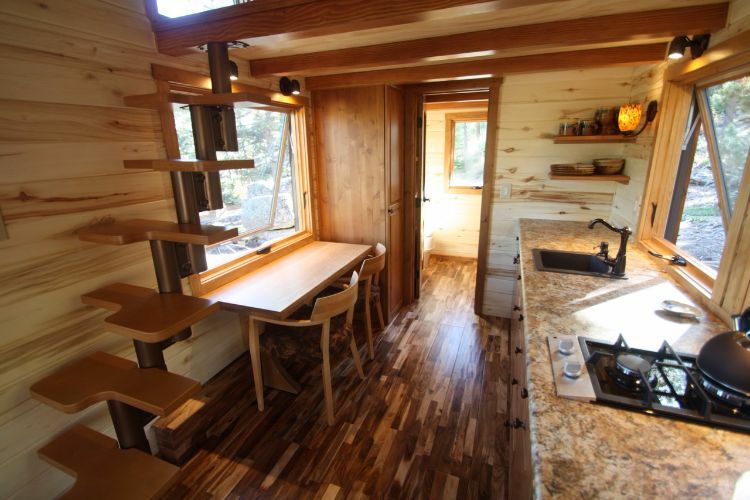 Open-plan interiors with sleek acacia flooring welcome us into this charming tiny home. 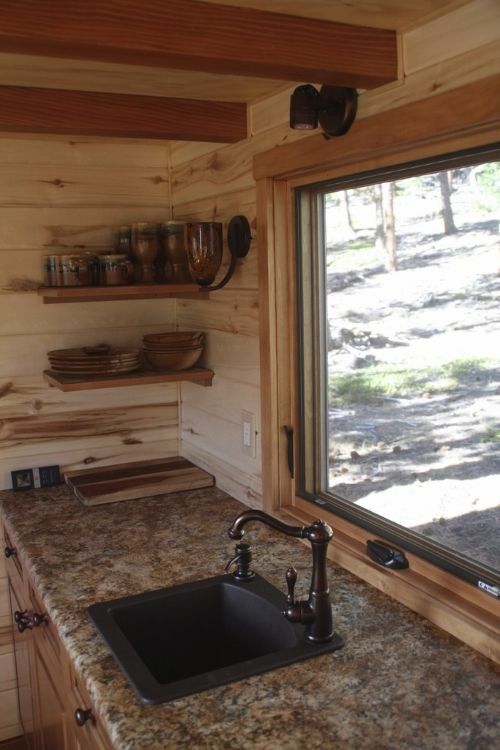 With all the right amenities, plenty of windows and a generous amount of interior lighting, the Stone Cottage has everything you need in a comfortable tiny cabin. As expected when simplicity is at play, attention to detail is what makes this wheeled abode a work of wonder. For instance, focus your attention on the living area. Stone walls with built-in speakers and a comfy couch invite you place to sit back, relax or even snuggle up to your significant other as you listen to some music or watch a movie. SimBLISSity rightfully boasts that their tiny homes are designed for four-season living. 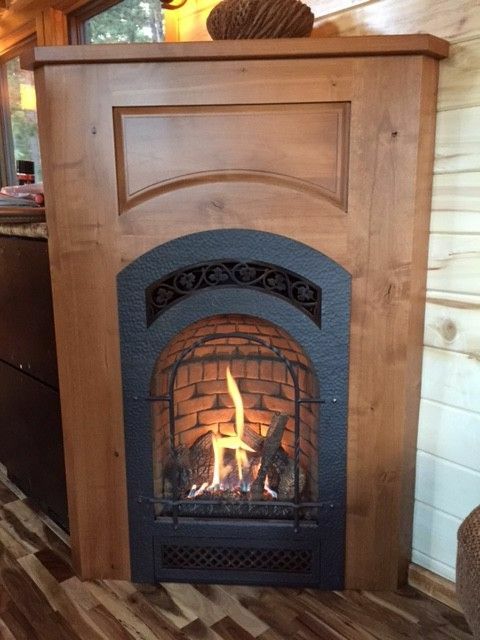 That gorgeous propane fireplace is a testament to this - after all, it is an essential element for any tiny house that needs to stay nice and warm during those cold mountainside winters. As we progress through the cottage, we find ourselves in its elegant kitchen. 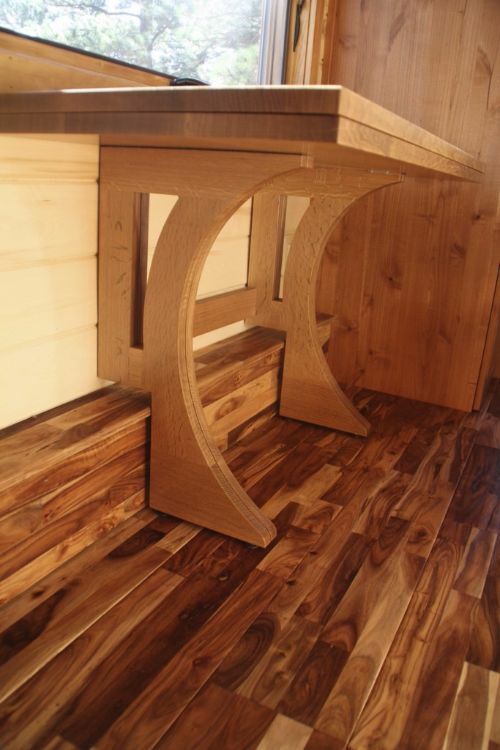 Fun fact: this dining table can be folded out to fit up to six people! So if your happy place is in the company of others, why not invite some guests over for dinner by the mountains? 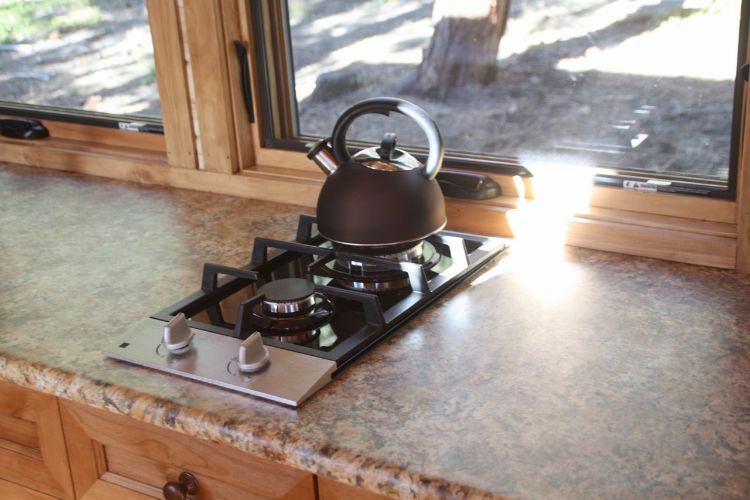 Isn't that two-burner cooktop adorable? Minimalist, yet sufficient - as is ideal in a getaway like this. As you can see, there is ample shelving and storage space in the Stone Cottage kitchen, and even the most extraordinary details like the kitchen sink have been molded into a work of classical art. Now that we're done with the kitchen, we will walk straight ahead to get to the bathroom. 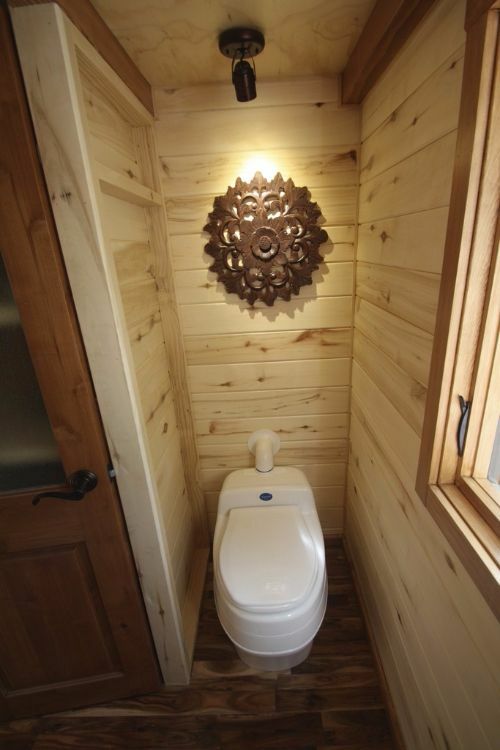 Proving that you don't need much to add a unique, decorative flair to a room, this compact bathroom is nicely adorned with a wooden hanging fixture that naturally blends into the classic interiors. 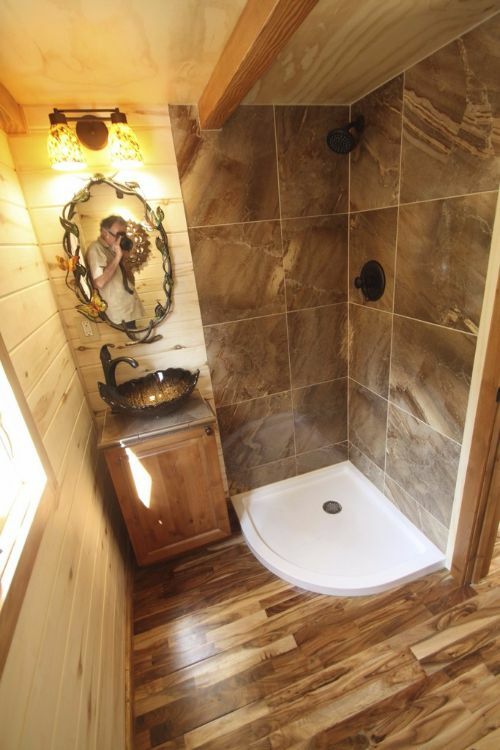 Look at the shower and vanity now. Again, less is more when it comes to decor - matching adornments on the mirror, the basin and the lighting fixtures play with spring-inspired motifs, adding another natural dimension to this splendid bathing area. That's the last room downstairs, so let's make a u-turn back to the main area of the house. 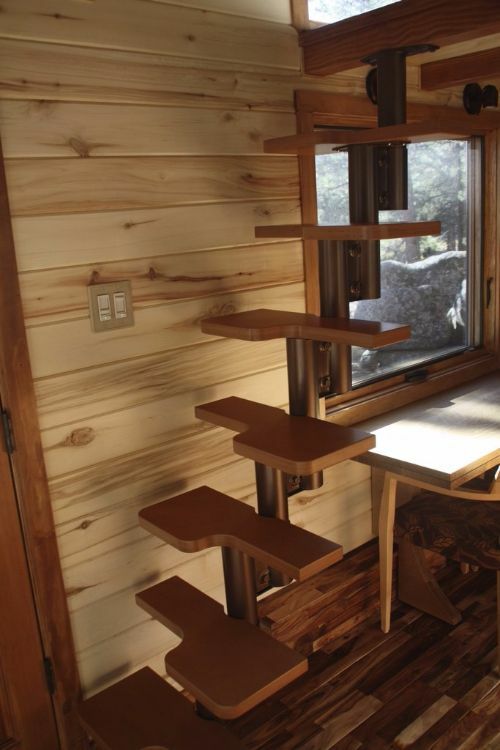 A modern alternating tread stairway takes us to our final stop for this tiny house tour. 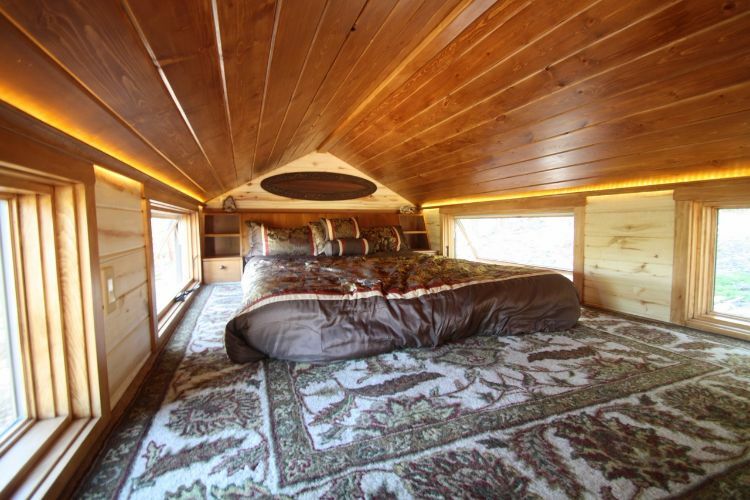 This is, of course, the sleeping loft. This spacious bedroom is 50-inches (1.27-meters) high and has been created with romance in mind. A queen size bed and LED cove lighting are some of the main elements that provide a relaxed, romantic atmosphere to the sleeping area. The extra floor space was a client request - according to SimBLISSity, the Stone Cottage's lucky owners didn't want the loft to obstruct the dazzling views that they get in their house. 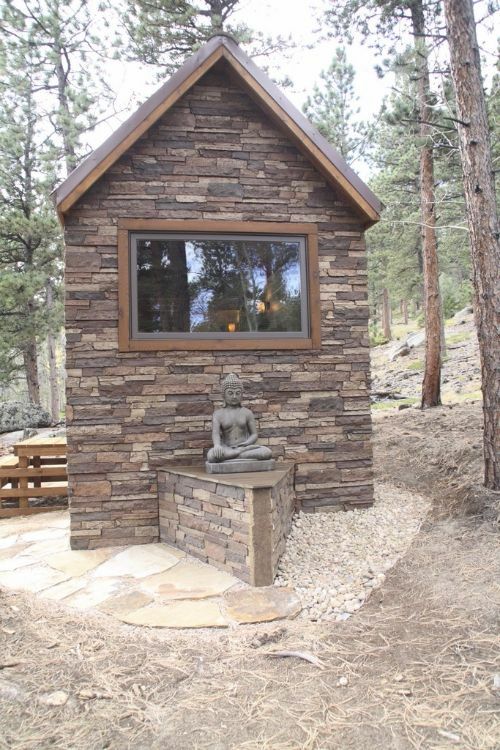 If you ever considered buying a cabin in the woods, the Stone Cottage is what you get when you add tiny living to the equation. 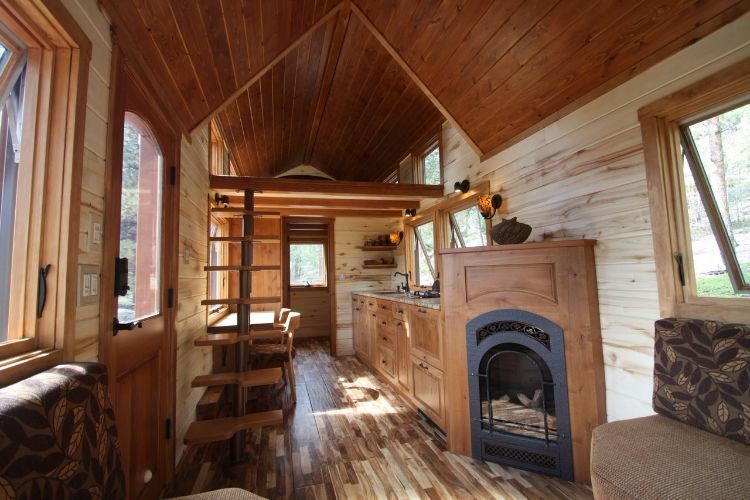 A stylish tiny house on wheels that is comfortable and complete, this truly is the ideal abode for tiny living enthusiasts who are looking for a sanctuary brimming with bliss.